We’re huge fans of onesie clad babies here at Babyology HQ and have discovered a fabulous organic cotton selection full of awesome colour and silkcreened goodness, perfect for keeping our littlest family members comfy as our days begin to heat up. What’s an Australian summer without a selection of onesies becoming a baby’s capsule wardrobe? Thief & Bandit play host to a plentiful selection of all-in-ones in both sleeveless and long sleeve onesie styles (priced US$40), perfect for our upcoming summer and for the slightly cooler nights when a bit of length doesn’t go astray, the sleeveless rompers in this collection (priced from US$78) are divine. Each buttery soft piece in this collection showcases a sublime print which is sure to please both contemporary tots and adults. Organic jersey is silkscreen printed with non toxic water-based inks and each print is designed by Thief & Bandit owner and founder, Amie Cunningham. 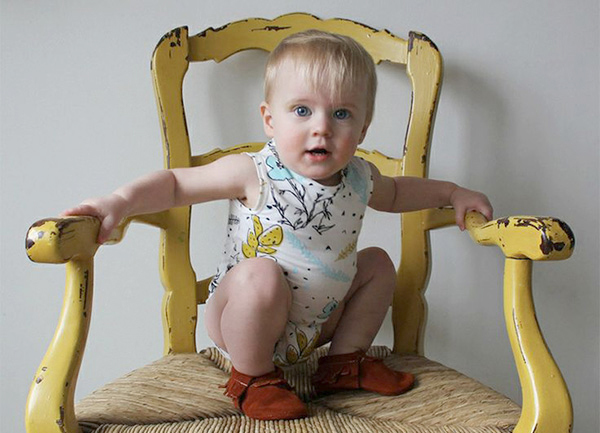 Thief and Bandit kids’ clothes are designed with kids in mind – each item is as soft and snug as it is durable, perfect for comfy naps, crawling and playing. Onesies and rompers are sized for children aged three months to two years. Buy direct from Thief & Bandit, with delivery to Australia available.